A stepladder is a small folding ladder. Its steps lead to a small work platform that is wider than the steps. The scales allow work to greater heights. If the simplest must be supported on a support, the most advanced can be unfolded in the manner of a stepladder, on flat ground or even in a staircase. 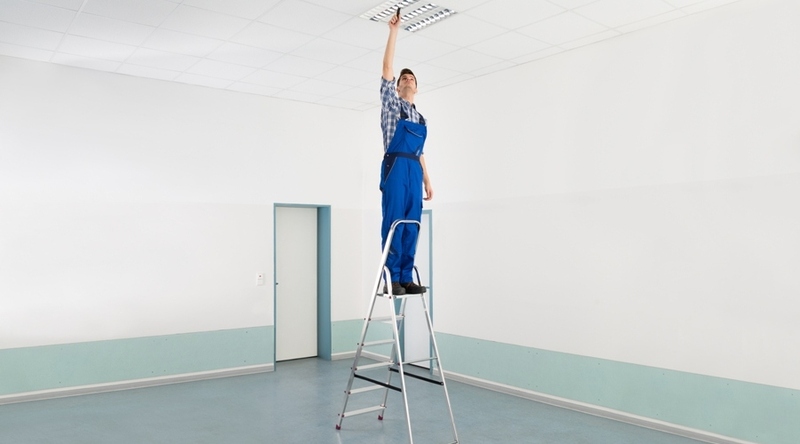 As ladders always have to be held with one hand, stepladders and ladders are to be reserved for occasional use or to be taken to a work surface such as a roof . The scaffolding consists of large working platforms fixed to the vertical uprights. They allow working a long time on a large surface while having his tools and by offering safety devices more or less effective to avoid dangerous falls. Ideal indoors for plastering and painting. Depending on their size, they can be used indoors or outdoors. What Size for My Equipment? It is important to consider the working height. For stepladders and scaffolds, two meters must be added to the height of the platform. For ladders, one meter must be added to the highest point of the ladder once laid. Rest assured, no scholarly calculations to make, manufacturers provide this indication by considering a person of average size. There are different qualities of stepladders according to your use. The more intensive the use, the more resistant it is , and therefore expensive! The steps of best household ladders are 8 cm deep and riveted. They are equipped with anti-slip pads, and especially useful for troubleshooting at a lower price! The steps of DIY stools are about a dozen centimeters deep. They are fixed more firmly to withstand horizontal stresses such as those exerted during the drilling of a wall for example. 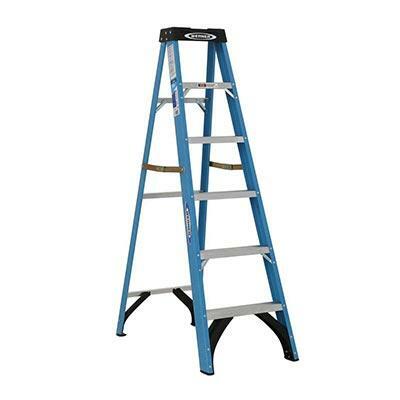 A tool shelf at the top of the step ladder is very convenient to put tools and hardware when working at height. They are more stable and more robust. This is the improvement of DIY stools. Stronger and able to have safe and practical options, professional stools resist more frequent use. They are more stable. These are stepladders with a spacious platform and wheels. They make painting or cleaning at height easier, a little like scaffolding. They are stable but in return, they do not bend, which complicates their transport, especially for the highest. They must be assembled and disassembled after use if we want to store them in a minimum of space. All stepladders must comply with EN 131 and NF EN 14183 standards, which require 0.9 mm thick steel profiles and 1.2 mm thick aluminum profiles to guarantee a load resistance of 260 kg . Beware; however, low-end stepladders may take the game, which does not happen on stepladders of better quality. And why not a Ladder then? Articulated: they are made of small sections of scales articulated between them by locking joints. So you can install them in a staircase or withdrawn from a wall at the foot of which is an obstacle to avoid. Supplied with a tray, they are transformed into small scaffolding extra for your interior work. Clever both in one! 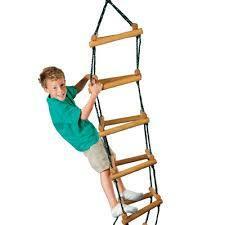 Sliding two or three sections: uses are the same as simple ladders. By sliding the sides of these ladders, you can work higher than with a simple ladder. Folded, they are relatively compact. They remain heavy enough to handle. Convertible two or three sides: in addition to the use of the sliding two-sided, you can install these ladders in the manner of a stepladder. The transformable ladders with two sides can also be installed in the presence of steps. Practice on a staircase! Platform ladder: This is a two – or three – level ladder with a platform surrounded by a guardrail to provide a safe working surface. The sliding and transformable ladders make it possible to work at height and in various configurations despite a small footprint. This is a significant advantage. The EN131 standard stipulates that the bars must each support 150 kg. The transformable two and three-section ladders are protected against the spread of the panels by means of a strap. Choose non-slip pads to avoid leaving unsightly marks on the surfaces against which you will support your ladders – if you can protect surfaces! Some options to know on the scales? Wide hooves for better grip. What is scaffolding and why use it? The platform of a stepladder does not have a large surface. As for ladders, they require users to always stick with one hand to avoid falling. Thus, for work requiring the use of two hands or to work on a large surface, these two products are not very suitable. Perched on the large, welcoming platform of a scaffold, you have both hands free and you can move freely on the platform to complete your work while putting your tools or materials like paint. It feels safe and ultimately, it works faster! Depending on the work you have to perform, you have the choice between different scaffolding. Rolling scaffolding: these scaffolding with wheels are very mobile and versatile. The maximum working height is 8m outdoors and 12m indoors. They must comply with the NF EN 1004 standard. Folding scaffolding: literally and figuratively, they bend over backwards for you. Very easy to implement, they can work at heights up to three meters. They are not very wide and some therefore pass the doors without having to be folded. Hyper practices so for the renovation of an interior. A pair of wheels facilitates their movements. In return, the safety devices are set back and they do not support more than 150 kg. They must comply with EN 85-200. Fixed scaffolding: they are reserved for big jobs in outside. For example, you can see some when facades are being renovated. They must be mounted on site. Their purchase is expensive. They are therefore reserved for heavy work. The best structures reach stunning heights! What differentiators for my scaffolding? Finally, scaffolding easy to assemble saves you time and save your nerves! Can we make a small assessment? Whatever the solution chosen, it is essential to take into account the height of work and that it corresponds to your needs. Check that your ladder, stepladder or scaffolding complies with its standard. If stepladders or ladders allow for a spot job or to serve a space, the scaffoldings bring you the comfort and security you deserve. Read the instructions carefully to avoid accidents and be sure you have everything you need to use them safely. And above all, vigilance is essential! For all work at height as on a roof, the wearing of a safety harness is mandatory.